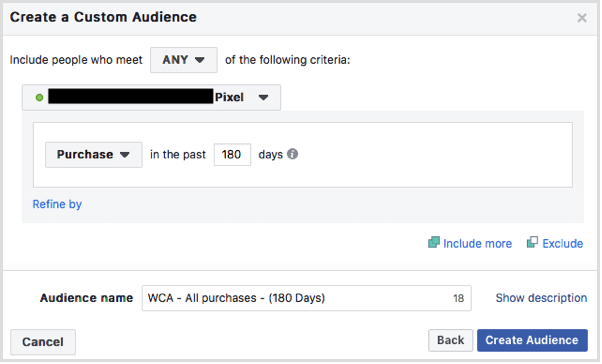 So, you are not getting enough sales from Facebook ads. 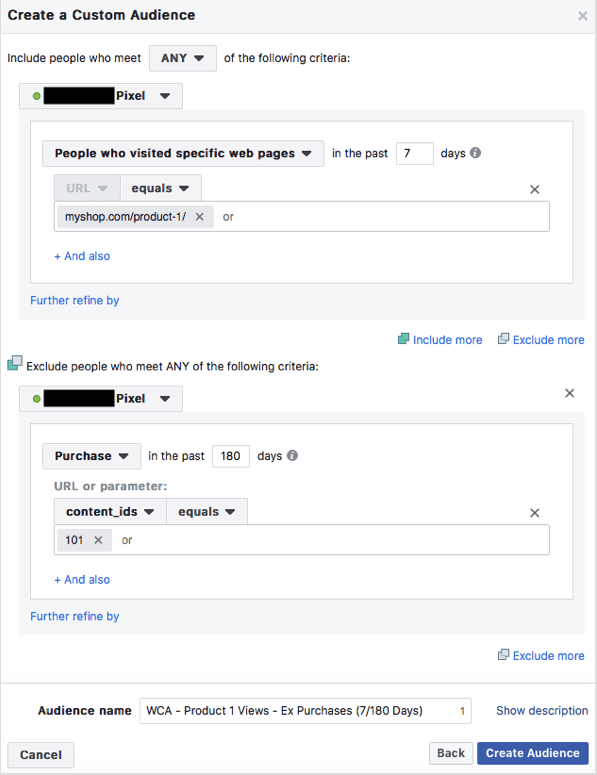 Want to generate more sales from Facebook ads? 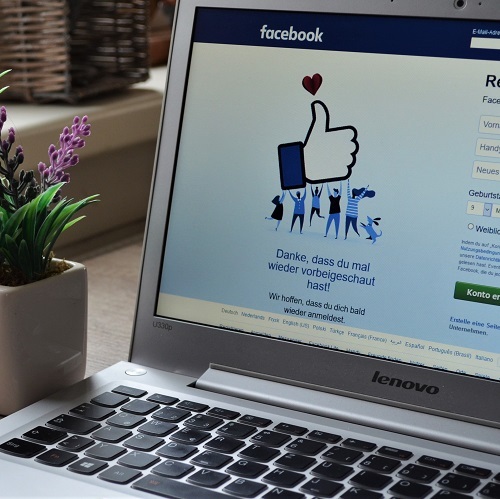 Facebook is one of the easiest and effective ways to advertise online. You can easily find people, choose your target audience depending upon interest, behaviors and demographics. Facebook ads can be used to drive a large amount of traffic to your website, generate leads, promote services and sell products. You might be worried about your ad may be shown to the wrong people and you are extremely concerned about showing the ad to the right people. Don’t worry, the Facebook ad targeting options are very precise, which ensures that you reach out to the right people. In this post, we will look into the second type of targeting i.e.Custom based targeting which means reaching out to people who interacted with you before. 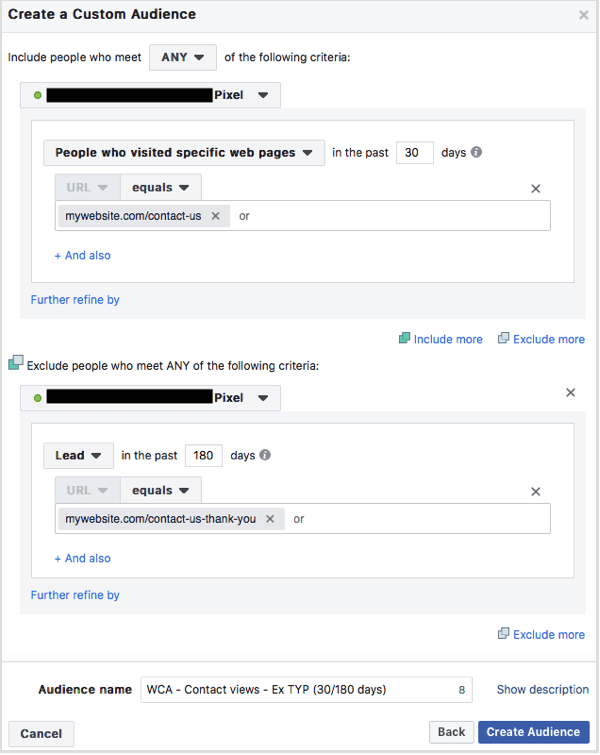 Also, we will see different ways to target your website visitors using this targeting option. Suppose you have an excel sheet of somewhat 5000 email ids and you want to show your ads to those people. Then you can use the customer file. 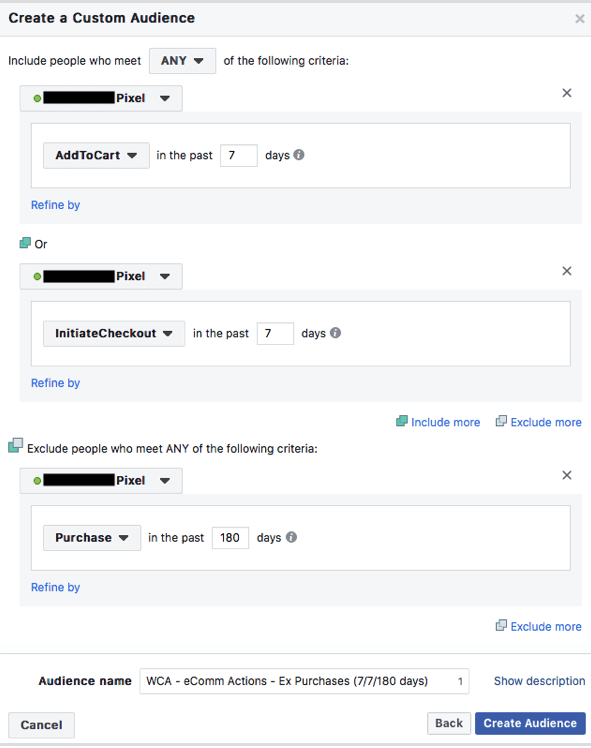 Customer file allows you to upload these excel file to Facebook and Facebook will show ads only to those 5000 people whose email id are included in the list. Basically, you can upload your own data and the ad will only be shown to those people. You must have noticed whenever you browse any e-commerce website and try to buy a product. But you don’t buy the product and just close the window. Now, the same ad follows you on other websites you visit. This is known as retargeting. Retargeting means reaching out to people who have already visited your website. 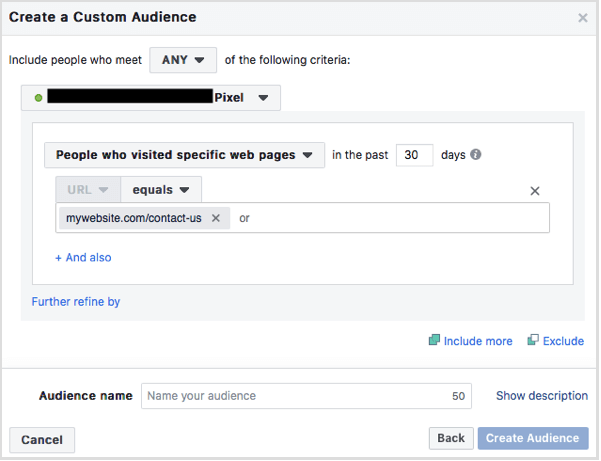 In this article, we will see how to who have already visited your website using Facebook custom audiences. Suppose, you have developed an app for business and you want to target the audience who are interacting with your app. For example, you can target people who installed your app, used your app but did not visited the app again for the past few days. Engagement custom based audiences help you to connect audience who have either liked your post, shared or even commented. You can even segment your audience depending on the content such as video or post. 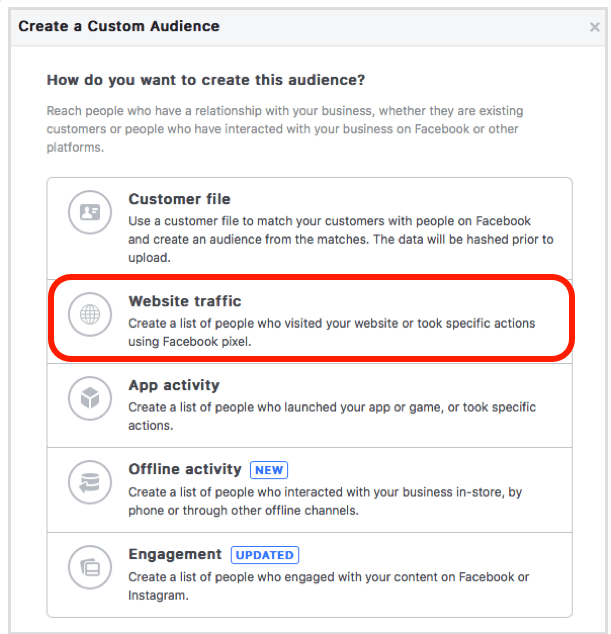 As we have already discussed what is website traffic based custom based audiences now let’s see how to create website custom audiences. 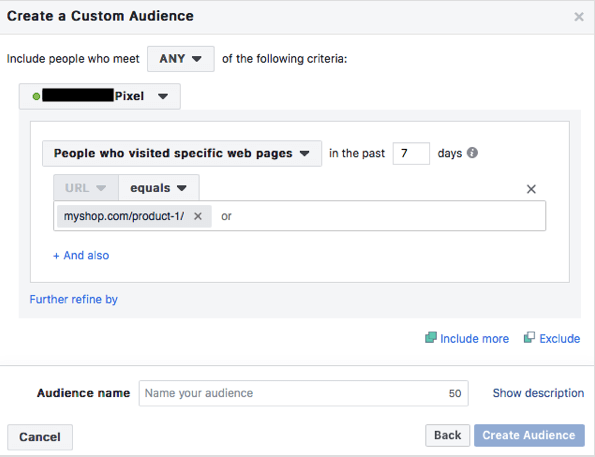 To create you first need to install relevant conversion tracking pixel and Facebook pixel. Go to Audience Dashboard through Ads Manager. Now, let’s look effective website custom audiences to target. 1 Target everyone who have visited your website. This the default which you will find when creating a custom audience. This is an ideal option for those websites who are not getting the required traffic. The next step is to select the timeframe. Here you can set the time slot for the visitors who have visited your website in the past few months or years. Remember if you select the long duration the reach will be maximum but if you set it for short duration the audience will be more relevant. 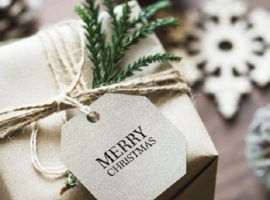 2 For E-commerce website: Target those visitors who browse through a particular product page but did not make a purchase. This targeting option is specifically for e-commerce websites who wish to target that set of audience who tries to buy a specific product but did not complete the purchase. 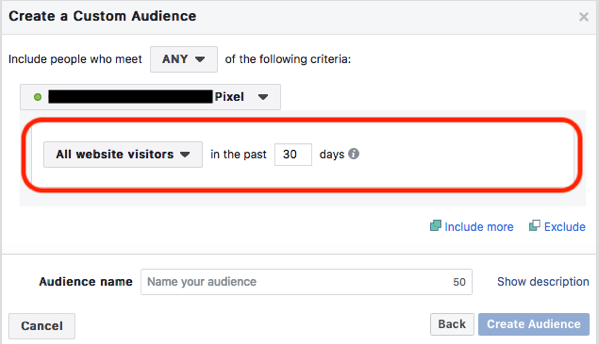 To create such type of audience, select People Who Visited Specific Web Pages instead of “all website visitors” which is by default. The next step is to select Equals from the Contains drop-down menu and enter the URL of that product page which your visitors have visited and you wish to include in your audience. Note: Do not include HTTP:// or www in the URL. The next important step is to add an exclusion condition. This is used to exclude a certain set of audience who do not meet certain criteria. After that click on the URL and select content ids present in the parameter. Now, click thecontains drop-down menu and select Equals and enter the ID of the product. This method will help you to filter the audience and refine the purchase conditions to match only the purchaser of the particular product. The audience who have already purchased the product. For the 1st option, you can set a duration of 1 week and if you have too low traffic make sure to increase the duration. You must exclude as many people who have already purchased the particular product. So, you can set this duration for approximately 6 months. To add an exclusion condition, click Exclude in the right bottom of the page and select Purchase from “From Your Events’ drop-down menu. Again a very effective targeting option for an e-commerce website. Sometimes a buyer starts the buying process, adds a product in the cart, but closes the window without taking any further option. 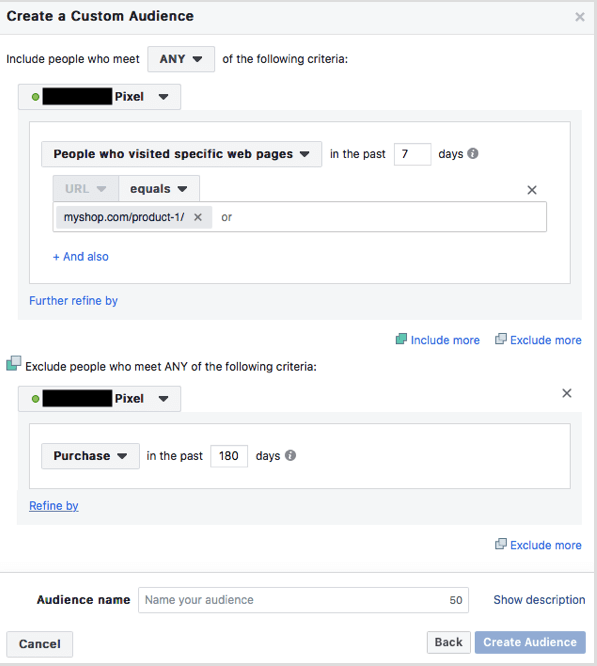 This advanced targeting option helps you target such type of visitors. Select the Initiate Checkout action. 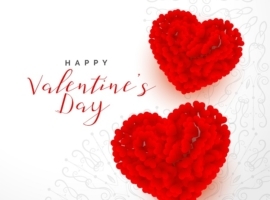 4 Target set of audience who already made a purchase from you. Website custom audience allows e-commerce website to target visitors who have already made a purchase from them. With the help of this targeting option, they offer exclusive offers to those audiences. You don’t have to include or exclude anything just select the audience time-frame and you are done. 5.Target those who regularly read your blogs. So, you have a blog on your website. Then, this website custom audience is for you to target those who visit your blog or specific pages of the blog. This will help to group all the visitors who have visited those pages on the website having word blog in the URL. 6 Target those who browsed through your contact page. This website custom audience group’s people who have gone through a contact-us page on your website. This is the best targeting option for that business who want to track down the audience who wishes to work with them. Enter URL of the contact us page. Select the action which you have put on your contact us page. Example, if you have installed lead action, then select the Lead option from the drop-down menu. The final step is to set the audience duration. If you the exclusion time maximum the ads will not be shown to those who have already contacted you. Keeping it for short duration will improve your ad targeting. 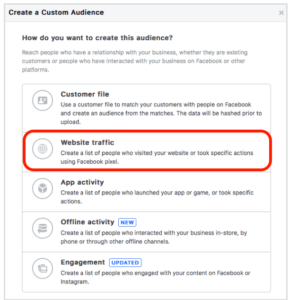 Facebook is day by day innovating and rolling out new features awesome targeting options which are helping business to target or retarget their audience. Thanks for uploading such useful blogs it really helped to reach my target and solve the problems faced. 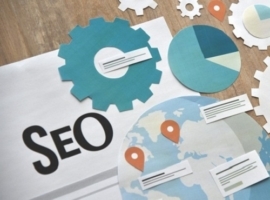 Challenges Of Today Insist Upon Skilled SEO Specialists Propelling Up Your Site!